In Laos, newly-empowered consumers are basking in the benefits of the polymer industry without knowing the consequences of their consumption on marine ecosystems. A US$65-million-plus Mekong River Integrated Management Project in Pakse town, Champassak province is set to begin construction at the end of this year, officials in charge of the project have confirmed. The project comprises four components including the construction of an embankment along the Mekong and Xedon rivers which totals over …. African footballers as young as 14 are being trafficked to Asia and forced to sign contracts, the BBC has learnt. Six minors are still with top Laos side Champasak United, after it imported 23 under-age players from West Africa to an unregistered football academy in February, a BBC investigation found. Fifa regulations prohibit the movement of players to a foreign club or academy until they are 18. The club, based in the southern city Pakse, denies any wrongdoing. “Fifa is in contact with several member associations in …..
Search teams on Thursday recovered the flight data recorders of a Lao Airlines plane that plunged into the Mekong River in bad weather killing all 49 people on board, officials said. The black boxes, which include both voice and data recordings, were found early Thursday as part of efforts to recover parts of the stricken craft from the river’s fast-flowing waters, according to Yakua Lopankao, director general of Laos’ Department of Civil Aviation. “It has not yet been decided where to send them to be examined, it is up to the air accident investigation committee,” he said of the operation, which has been assisted by experts from …..
Lao authorities have clarified foreign media reports which stated that the black box recorders had been recovered from the Lao Airlines plane that crashed in Champassak province last week. Recovery teams from Laos and France had detected a signal from the black box recorders but had not yet been able to locate them. “We can detect a signal but we cannot pinpoint the location of the black boxes,” an official said, adding that the signal was quite strong and indicated the direction of the source of transmission. “But this doesn’t mean we have retrieved …..
A part of the Lao Airlines plane that crashed into the Mekong River last week was retrieved on Tuesday, but the black box from the ill-fated aircraft has still not been found. Lao divers and rescue workers hauled the 10-metre part of the stricken ATR 72-600 from the bottom of the river at 3.30pm and painted the airline logo and plane number in black. 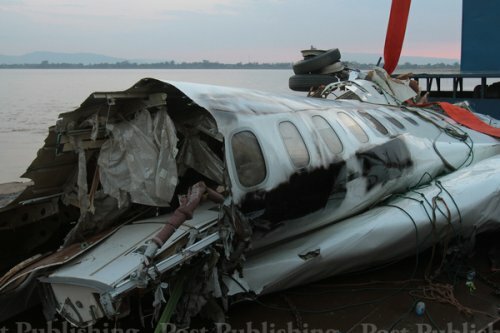 The plane, which was found about 400 metres from the crash site, was transported by …. Lao authorities and Lao Airlines officials are putting every effort into the recovery operation after flight QV301 went down in Champassak province on Wednesday afternoon, retrieving the bodies of the victims and the wreckage of the plane from the Mekong River. Flight QV301 departed Vientiane for Pakxe at 2:45pm on Wednesday and crashed just over an hour later while approaching Pakxe airport for landing, after running into bad weather in the wake of Tropical Storm Nari. All 49 passengers and crew on board are believed to have died after the plane plunged into the Mekong River near Phaling village in Phonthong district, in what is thought to have been a high impact crash…..
National carrier Lao Airlines officially began daily Savannakhet-Bangkok-Pakse flights on August 1, after previously flying the route only three times per week.